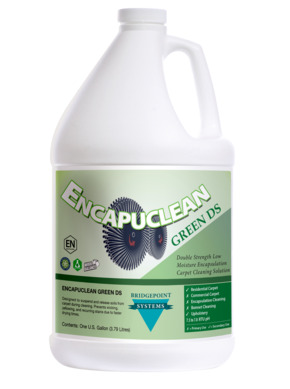 Based on the latest technology in green surfactants and encapsulating polymers, Encapuclean DS with Maxim suspends and releases soils from carpet during cleaning. The polymer attaches to carpet soils and fibers and then dries to a very hard polymer. When vacuumed, the dry brittle polymer fractures away, taking the attached soils with it. Encapuclean DS with Maxim employs a new exclusive, proprietary non-hygroscopic polymer that allows for even faster drying times than other encapsulation products. Carpets cleaned with Encapuclean DS with Maxim most often dry in less than an hour preventing the wicking, yellowing, and recurring stains that often plague commercial carpets. Subsequent vacuuming performance is enhanced with carpets actually getting cleaner with each vacuuming. Encapuclean DS with Maxim has all of the ingredients of Encapuclean Green DS with the addition of an acid dye resistor which adds stain resistance to nylon and wool fibers. It cleans with a fresh, green approved fragrance that your customers will love. In addition, its new ultra-concentrated formula provides twice the coverage of conventional encapsulating cleaners. Encapuclean DS with Maxim can be safely effectively used with cylindrical counter rotating brush, rotary brush or bonnet, oscillating, or orbital agitation machines for high performance low moisture cleaning.